O Milk is an all natural, Brooklyn-based nut milk company that creates really delicious nut milks started and run by a husband and wife, Greg and Julie Van Ullen. I took a liking for nut milks when I did try juice cleansing earlier this year. As it’s creamy, rich and a slightly sweet. Also, I’ve been drinking homemade soy milk my entire life (my parents know how to make it and they used to make it at least once a month) and it’s not far off from the richer nut milks. As a woman who adores her dairy, OMilk does make some ridiculously good vegan milk. During my “milk” and cookies snack time, I took the opportunity to taste each milk with my beloved chocolate chip cookies. The almond milk had the mouthfeel of skim milk with a subtle hint of nutty almond. The classic cashew milk was halfway to a cashew milkshake to me. It’s creamy, rich and pleasantly cinnamon-y and sweet enough that I am content to have this as just for breakfast or my light dessert drink. The cold brew coffee almond milk would be my mid-afternoon pick-me-up as it’s wonderfully coffee flavored. When I did receive my shipment of OMilk a few weeks ago, they were transitioning seasonal flavors and I ended up more almond milk (current seasonal offering of pumpkin pie cashew milk). NYC was still in Indian summer weather mode and I wanted to do something more than just drinking the almond milk (that would be too easy) and wanted to create a healthy, cold dessert. I had a conversation with my mom about bubble tea and a light bulb went off in my head. I thought, why not make a pudding with the almond milk? 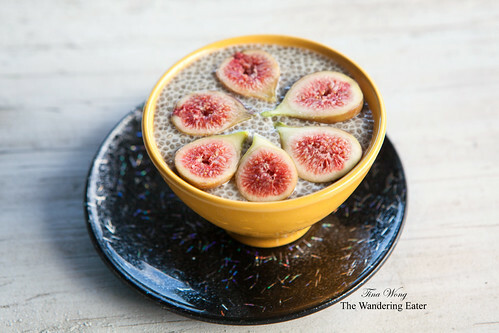 I looked at my pantry and I saw chia seeds and know that these seeds sort of mimic the “bubbles” (the chewy boba pearls) when it’s rehydrated but it thickens that liquid up – that’s how I came up with the almond milk chia seed pudding. I ended up topping the pudding off with fresh figs from my garden since my fig tree was fruiting like crazy. The best thing about this recipe, it does not require any cooking but does ask for your patience letting it sit in your refrigerator for a couple of hours and a little shake or stir in between. 1. Take a 1-quart jar combine the almond milk with the honey. Close the jar and shake to combine. Add the chia seeds and lemon zest to the jar, then close and shake well. Refrigerate until very thick and pudding-like, at least 4 hours or overnight, shaking or stirring occasionally. Serve the pudding in bowls. If you don’t have a jar, find a medium sized bowl and follow the above instructions and stir with a whisk. The pudding can be refrigerated for up to 5 days.